Global Positioning System (GPS) navigation systems work by receiving signals from satellites, and that isn't possible without some kind of antenna.The reason you usually don't see any sign of an antenna when you look at a GPS unit is that most of them have antennas that are either hidden inside, or built right into, the case. In addition to built-in antennas, many GPS devices also have the option to use an external antenna. While it usually isn't necessary to install an external GPS antenna, there are cases where it can help. Who Needs a GPS Antenna? If you’ve been using a GPS unit for a while, and you’ve never noticed any signal loss or accuracy issues, then you probably don't need any kind of external antenna. The only real exception is if you plan on driving somewhere you've never been before, in which case differing conditions in the new location could make an antenna necessary. If, on the other hand, you have experienced issues like signal loss or poor accuracy with a GPS unit, then the chances are pretty good that an external GPS antenna could be worth the purchase price. It really comes down to two things: the quality of the internal antenna that your GPS unit came with and the specific obstructions that you’re dealing with. The other possible situations involve switching from a portable GPS unit to an in-dash unit, or buying a brand new GPS device for the first time. In cases like these, it can pay to ask around if anyone in the area has had signal or accuracy issues with their GPS units before making an investment. GPS navigation devices function by receiving signals from a network of satellites that are part ofthe Global Positioning System. By taking the direction and signal strength of multiple satellites into account, the GPS device is able to reliably calculate its physical position with a relatively small margin of error. When a GPS device doesn’t have a clear view of the sky due to an obstruction, it may be unable to locate enough satellite signals, which may result in either a total failure to operate or degraded accuracy. This can be caused by things like tall buildings, but the roofs (and often windows) of cars and trucks also create obstructions that can degrade GPS signal strength. 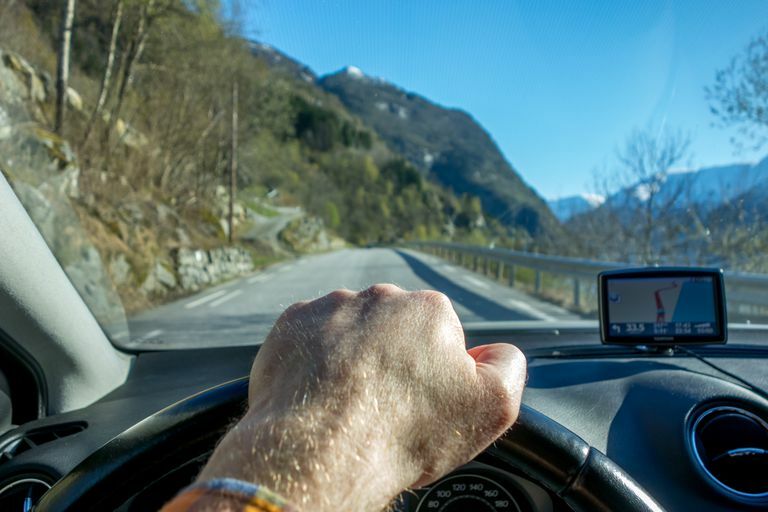 The effects of obstructions can often be mitigated by placing a GPS location in a window, but some vehicles are harder to deal with than others. For instance, metal roofs create more of an RF shield than ragtops, and tinted windows can include tiny metal particles that can also block the GPS signal. Most GPS navigation devices come with internal antennas that work just fine when presented with a clear, unobstructed view of the sky. However, these internal antennas are inherently less capable than larger external antennas, which can be either passive or amplified. In the case of amplified external antennas, GPS signal strength can be nearly doubled versus an unpowered antenna. If you find that your GPS unit sometimes fails to obtain a signal, or if it seems inaccurate at times, then an external antenna will usually fix the problem. It’s cheaper and easier to try moving the unit around in your car first, since that may help alleviate obstruction and interference issues, but you may find that the only viable solution is to install an amplified external antenna. External GPS antennas can be either passive or amplified. Passive antennas simply receive the GPS signal and pass it on to the GPS navigation device, while active units include a powered amplifier that boosts the power of the signal. The latter is typically more expensive and more difficult to install, but it can also be installed further away from your GPS unit than a passive antenna can. In most cases, a passive antenna should be installed with no more than three feet of coaxial cable between it and the GPS unit. Since active antennas can be installed much further away, they are better suited for use with larger vehicles.